SUPPORTING ROLES: Sir Patrick (centre), flanked by dignitaries at Monday's ceremony. 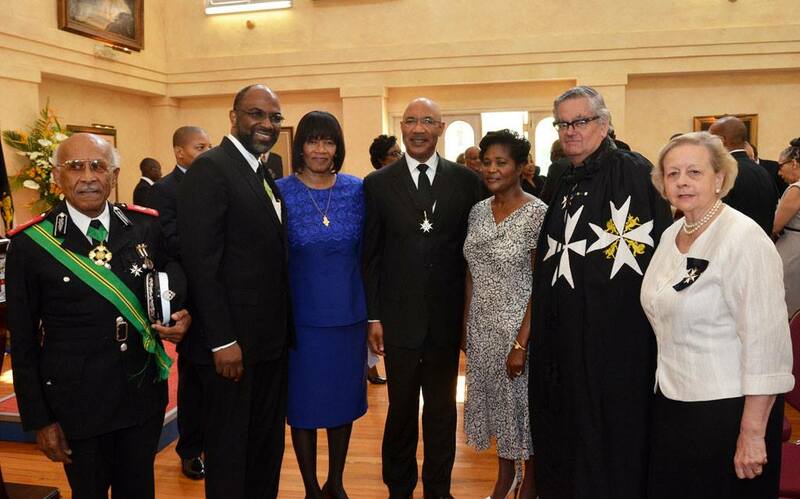 On Monday, September 2, Governor-General, His Excellency Sir Patrick Allen, was invested as Knight of Grace of the Order of the Most Venerable Order of the Hospital of St. John of Jerusalem. This is the second knighthood for Sir Patrick, who in 2009 received the Knight Grand Cross of the Order of St. Michael and St. George from Queen Elizabeth, when he assumed office. 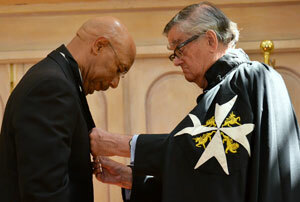 Lord Prior of the Order of St. John, Professor Anthony Mellows, representing the Queen, presided over the investiture ceremony held at King’s House. Among those in attendance were the Governor General’s wife, Her Excellency Lady Allen; PM Portia Simpson Miller; and Chairman of the St. John Ambulance Association, Earl Jarrett.